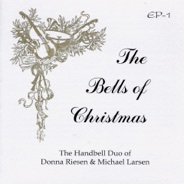 (Compact disc EP1) The Bells of Christmas, $15. Order more than one and get a special low price of $12.50 each, plus tax, S & H.
Contact Larsen & Riesen by e-mail, or write to the address above. •Angels' Jubilee, with themes from Haydn's Christmas Eve Canon and Angels We Have Heard on High. •Bells of Christmas, based on Carol of the Bells and What Child is This? •O Night Divine, with Bach's Jesu, Joy of Man's Desiring interwoven with Adolphe Adam's O Holy Night. •Nutcracker Trilogy, featuring Tchaikovsky's Dance of the Sugar Plum Fairy, Arabian Dance, and Chinese Dance. •A Christmas Canticle, with Pachelbel's Canon in D along with The First Noel and Jolly Old Saint Nicholas. •Tidings of Joy, in 10/8 rhythm using the carols God Rest Ye Merry, Gentlemen and Nuns in Frigid Cells. 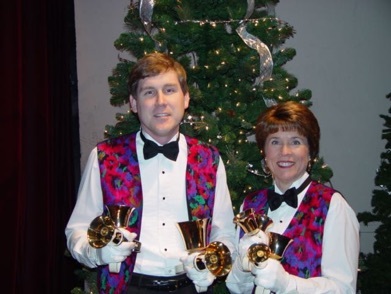 •Toccata & Fugue in D Minor, Bach's organ classic in a virtuoso performance on handbells and synthesizer!